Impetigo is a very contagious skin infection. This bacterial infection presents with blisters on your skin that itch and frequently pop open, releasing a pus-like yellow fluid. Once broken open, the blisters then dry up and become crusty sores. Scratching will spread the infection. The most common causes of impetigo are bacteria known as streptococcus and staphylococcus, both more commonly called strep and staph. Not only can you contract it by touching an infected person, but you can also contract impetigo by touching things the infected person has touched, including, not limited to, clothes, towels, sheets, and other bedding materials. Other skin conditions can make you more susceptible to contracting impetigo. These include dermatitis, fungal infections, body lice, and eczema. Even something as simple as an insect bite can increase your chances of getting impetigo. Ecthyma: Occurs when impetigo infects a deeper skin layer and may cause permanent damage, such as scars and changes in skin coloration. Post-streptococcal glomerulonephritis: A serious kidney disease that can develop when the cause of impetigo is a bacteria called group A streptococcus. Cellulitis: A more serious type of skin infection that can spread to your bloodstream and become life-threatening without proper treatment. Certain types of people are more at risk of contracting impetigo. For example, because children have a lot of contact with others and in large groups, they are an at-risk population, especially those who are between the ages of two and six. Anyone who lives, works, or attends school in overly crowded conditions or who plays a contact sport is also at a greater risk of contracting impetigo. The infection is more commonly spread during times of the year with warmer, more humid weather conditions and when a person has a cut or scrape. A medical professional can usually diagnose impetigo by examining the blisters on your skin. Once diagnosed, antibiotic medications and ointments may be prescribed to help heal the infection. He or she can also make recommendations for easing symptoms and preventing future breakouts. If you have symptoms of impetigo, you should see a medical professional as soon as possible. You will need medical treatment to heal the infection and to avoid possible complications. 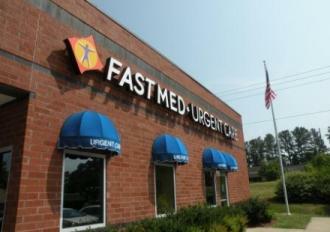 For prompt, personal medical attention, visit a FastMed Urgent Care clinic. At FastMed, you can avoid long wait times and get the help you need today. You can even use ZipPass, our online appointment scheduling system, which allows you to stay in the comfort of your home until a medical professional is ready to see you. Find the FastMed clinic nearest you today using our online locator tool.